September heralds the onset of autumn, as this damp, cool and rather overcast summer fades I might feel a pang of regret if it wasn’t for the finale of colour in front of the house and the foil of ornamental grasses. … it’s comforting to know the technicolour riot will last for several more weeks to come. The terrace links to the round bed at the north gable end of the house, here the colours are anchored by a dolly mixture assortment of pinks to lead into the boundary bed of hydrangeas. The key grass in both this border and the terrace is Calamagrostis x acutiflora ‘Karl Foerster’, a sterile hybrid and for the most part raised from divisions. On the right hand corner of the bed above is a monstrous clump of Molinia caerulea subsp. arundinacea ‘Transparent’, weighed down by rain and obscuring the narrow path. The blue ‘dumpy pine’ blocks the view of the drive and this year’s new planting area. Shown as 13 on the garden plan, this is the stylised meadow of Deschampsia cepitosa and Molinia caerulea subsp.arundinacea that was planted in late winter this year from seed raised plants. 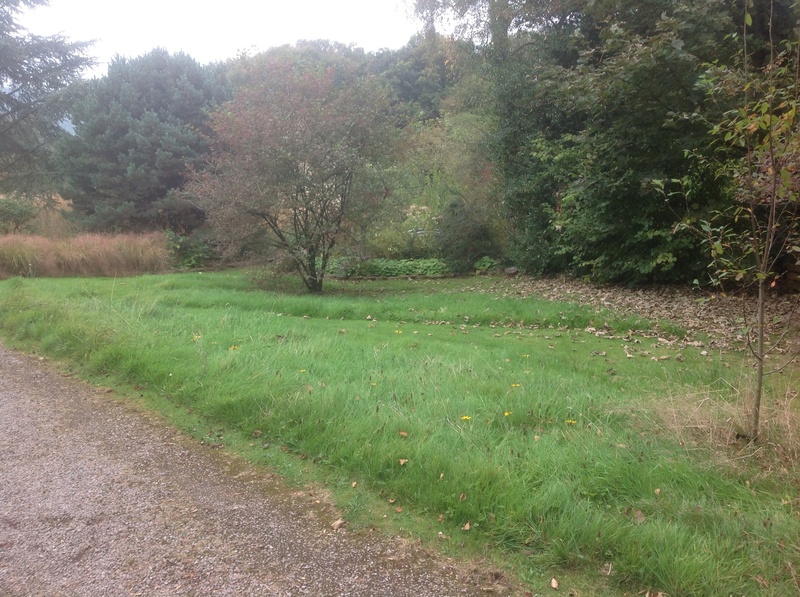 Sitting to one side of the drive the roughly triangular area is only about 300 square metres, not vast but large enough to require a significant number of plants that I started growing for this planting in 2011. 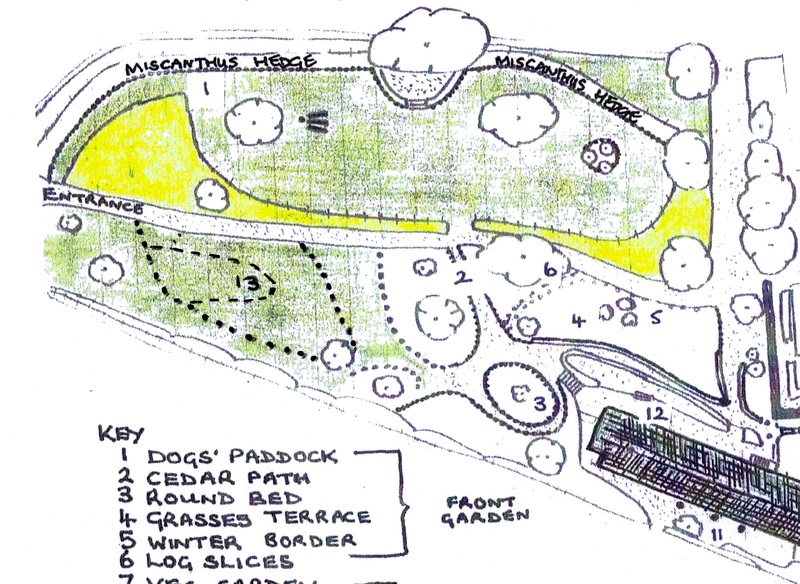 The design took shape last year, as an arc of rough grass bisected by mown paths. 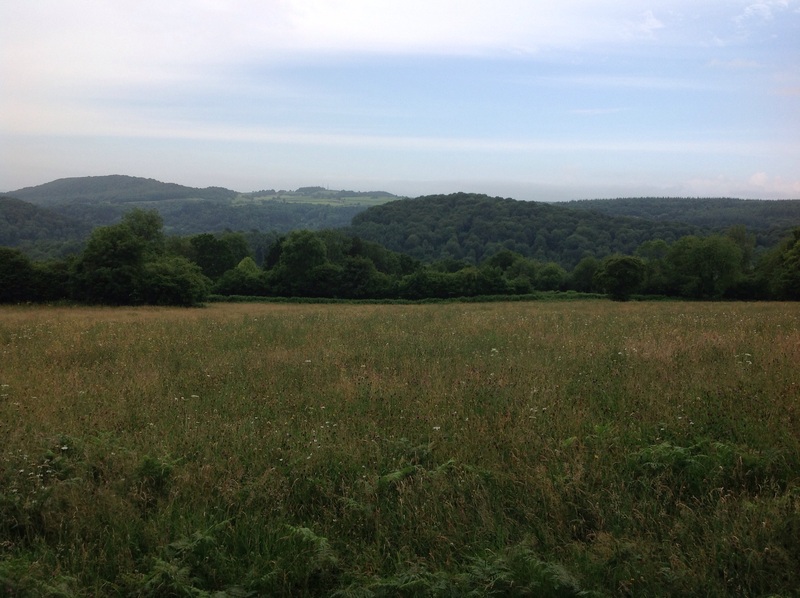 Last autumn the row of overgrown Leyllandii along one stretch of the boundary were felled, letting light and wind into the area, as well as allowing a glimpse of the valley’s hay fields and woodland. 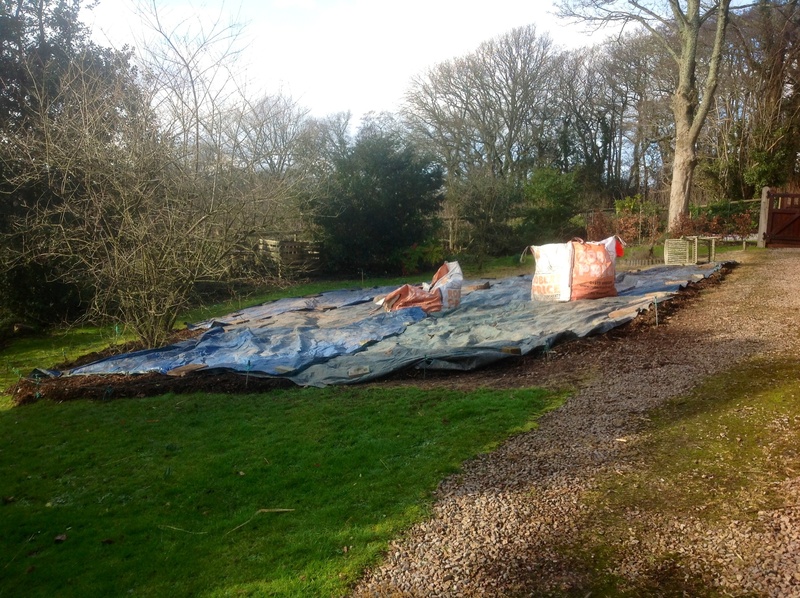 Our aim was to limit the work required to create the meadow, last autumn the turf was covered by layers of compost, cardboard, green woodchippings from the tree work and then covered with tarpaulins. For the most part we planted without ceremony – there was no double digging. Only the molinia, as the longer lived grass, was treated with the courtesy of larger holes, back filled with sterile loam and treated to a generous mulch of fine horticultural grit in a bid to keep creeping buttercups at bay. The results have been surprising. In early summer silvery deschampsia was studded with Papaver somniferum, bronzed by late summer it’s has been sprinkled with Rudbeckia ‘Goldsturm’ and Veronicastrum which was bought as ‘Fascination’ (but looks too pink to be such to me) and pixels of Vernbena bonariensis. 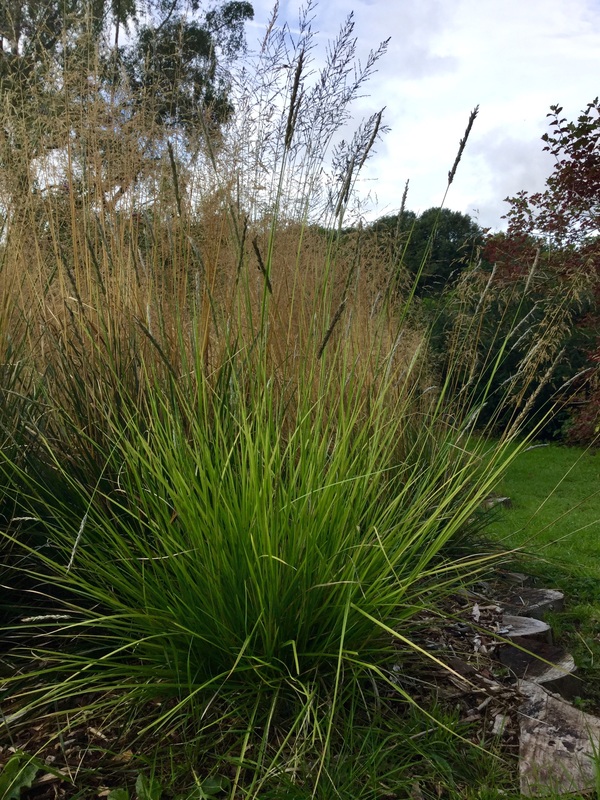 Rising above the froth of deschampsia on linear stems are the molinia – the offspring of the ungainly clump in the round bed at the back of the house. Perhaps this is a better home for them to arch and wheel above a wilder and woolier planting. 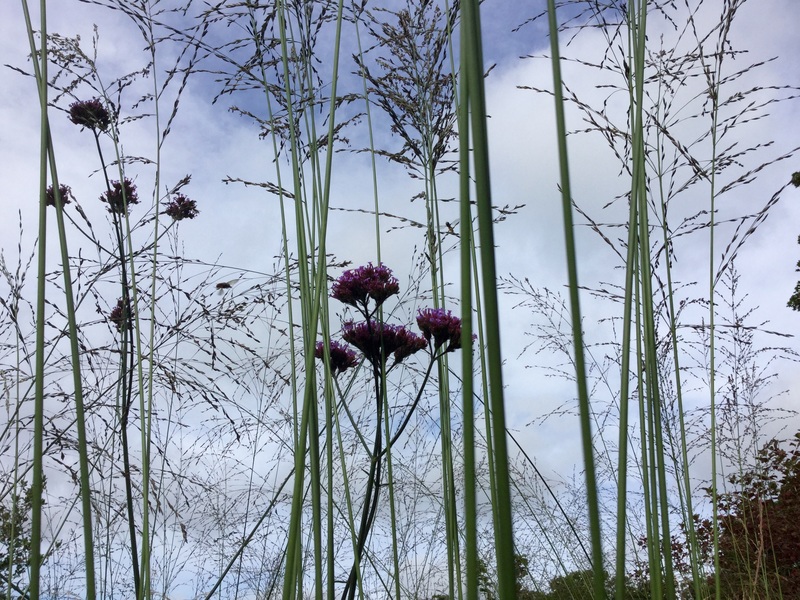 The haze of fresh inflorescense of Purple Moor Grass is best appreciated against a uniform background whether it be a tall evergreen hedge, a mass of perennials, or a dark painted shed … anything to provide contrast. In this case, the sky will do. Through the autumn the molinia foliage, stems and seed heads will turn a buttery yellow before dissolving in an easy to scoop up heap by December. By mid winter, the deschampsia and perennial seed heads will be all that remains as a whispy reminder of this year’s performance. Plus, no doubt, a prolific rash of deschampsia seedlings in the drive. Planted on the corner of the meadow is a third grass that I have in mind for edging the meadow, like the deschampsia another near evergreen: the chartreuse leaved Seslaria autumnalis. 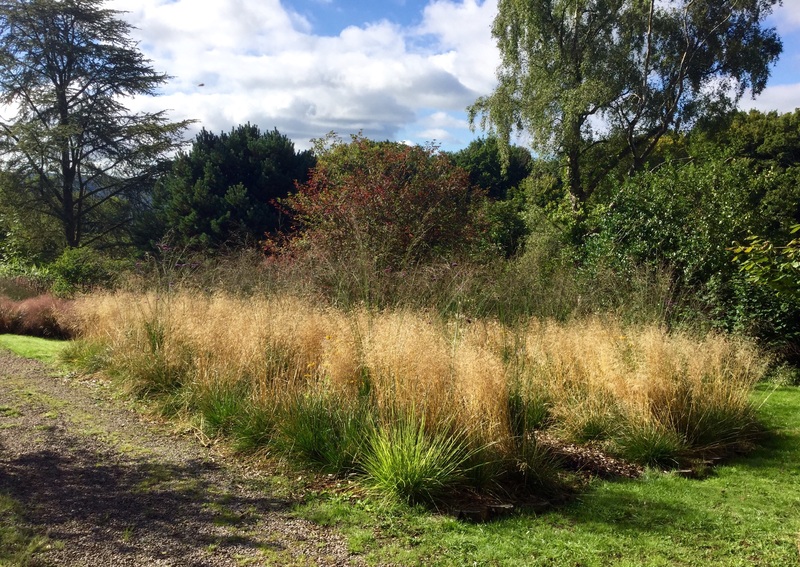 I think it will contrast with the height, colour and form of the other grasses and conceal the thatchy tussocks of the deschampsia. An unplanned finishing touch for the meadow has been the influx of the Common Blue butterfly that favours unimproved grasslands. 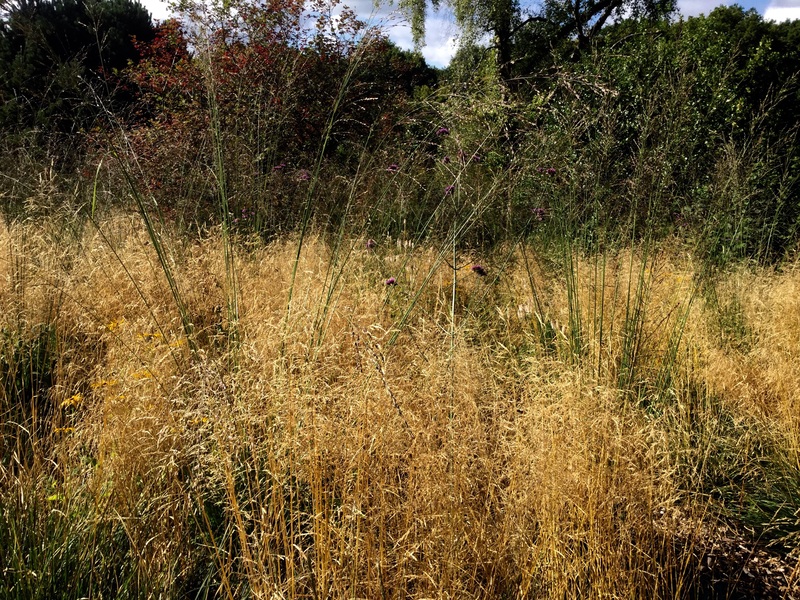 In August 2013 we started noticing the colourful males cavorting in the dried stems of calamagrostis in the terrace in front of the house while the shyer, duller brown females nestled among the veitches and knapweed in the rough grass bordering the drive. This August much to our delight a colony of them has made the little slice of ‘improved’ meadow their home. Absolutely stunning Kate. Beautifully planned, the grasses are a wonderful idea and look great all Summer, but late Summer is very special in a garden like yours. All your hard work and planning has paid off and must be giving you so much pleasure. I haven’ t seen blue butterflies for a long time, what a treat. Thank you for your kind comment Liz, the butterflies are a lovely bonus. You have obviously worked very hard to produce such a lovely garden Kate. It’s great to think that it’s not only beautiful in our eyes but jolly useful to wildlife too. I have never even seen a blue butterfly never mind had one in our garden. I have butterfly envy today. What a lovely thing to say, Gillian, thank you for suggesting the link to Wildlife Wednesday. I’ve seen a common blue just once, in Cornwall last year. They are beautiful. That is some fine planting. How brilliant to have raised all that from seed. Your reward of the blue butterflies is well deserved after all your hard work. 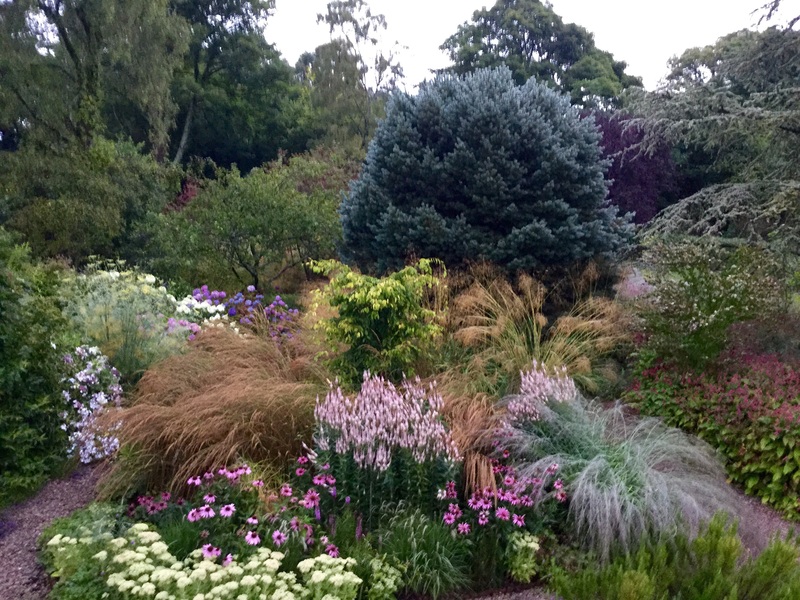 I’m pleased you like the planting, I enjoy propagating easy going plants – I can see deschampsia might be a bit of a nuisance in the wrong place. 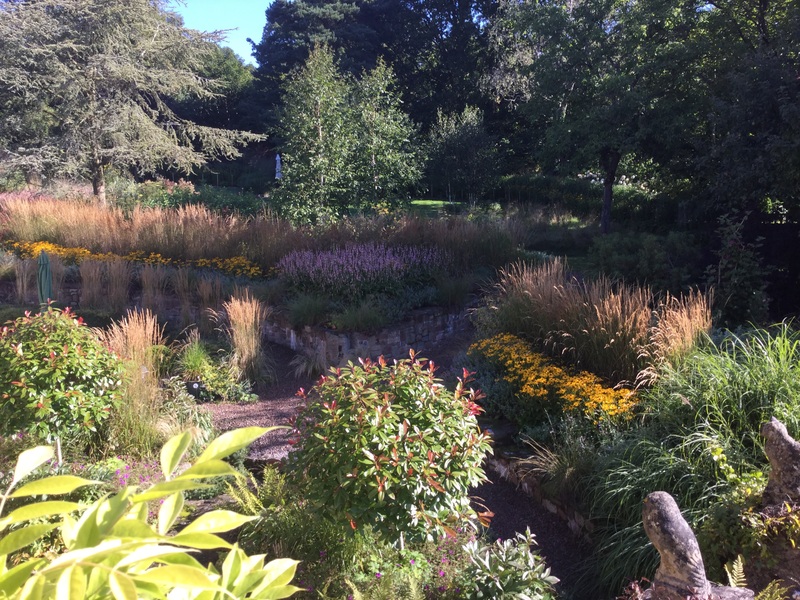 Hi Kate from springtime in Auckland, NZ – We use a lot of grasses but some early mistakes were planting mountain grasses in Auckland eg which is warm and humid. NZ has to be careful with plants that come from overseas as many just become rampant weeds! eg gorse! Where I live we have planted a ‘bird bush’ on a steep sunny clay slope with mainly NZ natives, including some grasses. It has only been in 15 months and omg the growth. I have chucked a lot of swan plant seeds for monach butterflies. The only problem we have a bad paper wasp population (stupidly brought in to kill white cabbage butterfly!!! They gobble up monach caterpillars – unfortunately they didn’t tell them only to eat white butterflies! grr. We have tiny blue butterflies and as pretty rural I think have increased.Usual spring weather, rain, squalls, hot, cold, puffy clouds, calm – weather being weather. This is a sub-tropical garden but I have patches of bulbs and pretty flowers. Love your flowy garden effects! Welcome Yvonne and thank you for taking time to comment, what you say about the potential problems of introducing new flora or fauna is very interesting. Thank you. Swoon!! Gorgeous garden, absolutely beautiful. Your Common Blue butterfly is so pretty. It’s great that you have encouraged a habitat that they are comfortable with–that’s exactly what wildlife gardening is all about!! Thanks for joining with Wildlife Wednesday. Thanks Tina for visiting the post and for the link to your excellent meme Wildlife Wednesday at ‘My Gardener Says’. You’re welcome Cathy – I’m pleased if it’s helpful to see the process … it’s never finished though is it? Gosh you have worked hard Kate, but how beautiful it is looking and when the sun is out and the butterflies are flitting it must be heaven on earth. 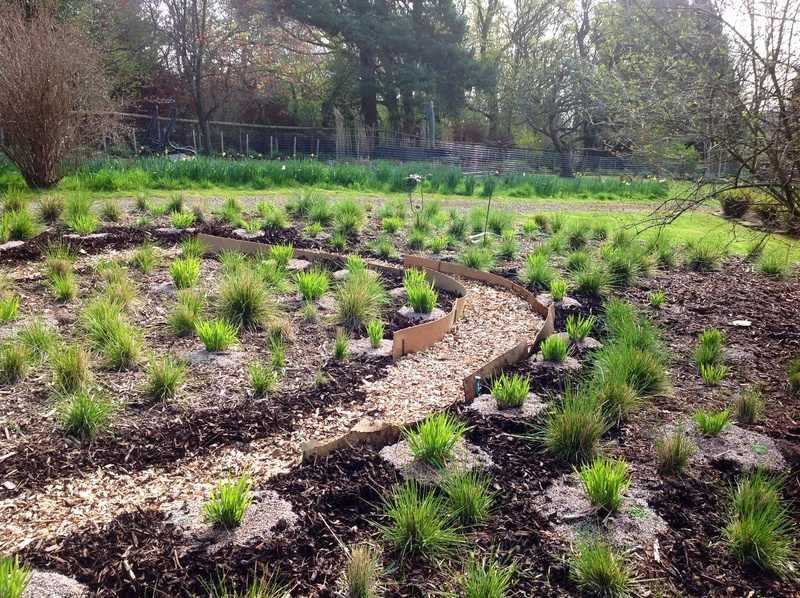 Really interesting too to see a slice of your plan, the work in progress and the finished planting. Thank you for confirming my panicum, but I will look out for Calamagrostis as I love how they stand through the autumn and winter. I now have two panicum in a South-facing border doing well, the other two in not such sunny positions not so good. Finally I will try and get a photo of the Pennisetum at Polesden Lacey, it is at its best right now so I should be able to get an OK photo. Thank you for all your inspirational posting and sharing all your knowledge so generously. I appreciate your thoughtful comment and look forward to seeing a pic of PL’s pennisetum. I’m still waiting for cultivars of P. alopecuroides to flower, they’re a bit late this year. Simply beautiful planting. You should feel very affirmed that the vision you had is now providing wonderful autumn texture and colour- I love that buttery molinia. Thank you, Sue. As an amateur it was daunting tearing up half an acre to make the front garden, so, yes, I’m relieved and delighted when things work out. Cool season grasses dry so beautifully and early too – I’m still waiting for the miscanthus to hit its flowering stride. So many things seem late this year. A work of art. Thank you so much for sharing the photos. Wow. I hadn’t realised till this year how much difference such a relatively small grassy area makes to the number and kinds of butterflies around. We have made a small wild area which has been full of ringlets, meadow browns and gatekeepers. It must be wonderful to have so many blues. They are so pretty on the underside to aren’t they? Well done on your beautiful planting. Your wild area sounds great, what a wonderful selection of meadow butterflies, hope you’ll post images? We’ve enjoyed seeing the studded undersides as much the wings – they blend into the grass stalks where they roost at night. The blue furry bodies are amazing too! I love how the butterflies navigate through the stalks, like a slalem! It makes pictures tricky though. No decent photos of the wild area from this year though. Maybe next….